The big Kramer telehandlers have been on the Czech agricultural market since last year. This is not a long time, however, despite this relatively short period of time, they have gained a lot of many satisfied users. One of the these users of the telehandler KT559 with the payload of 5.5 tons is also the company AGD Senice a.s., operating in Nymburk. In the company AGD Senice, the plant production has the most important role. “We farm an area of 1,150 hectares. In the field of animal production we only have pigs,“ adds Mr Havlík, the technician of the company. Like in the other agricultural facilities, also at AGD Senice the telehandler is used for most of the year. “At our site, the telehandler is used 300 days a year. We have a shovel, a fork and a hook on it. 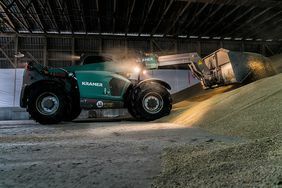 We use the telehandler mainly for loading and unloading of crops, for loading manure, fertilizers and seeds,” Mr Havlík comments the use of the telehandler, and adds: “It's the busiest machine of the season and we need one that works reliably. For example, during the harvest last year, the old one broke and we had to rent a telehandler. It was not easy because everybody needs a machine at that time." The Kramer telehandler can work in a safe, convenient as well as effective way thanks to the Smart Handling assistance system. “When loading trucks and piling the beetroot, I appreciate the programmable memory for the tool position, including the function of bucket shaking. For example, when we collected the beetroot, I programmed the shovel to pile horizontally.” Additionally, they decided to equip the telehandler with 360° halogen lights for night works. All in all the people at AGD Senice are really satisfied with their new telehandler which they used to the fulliest. 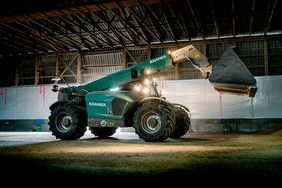 You want to know more about the Kramer telehandlers? Click here.